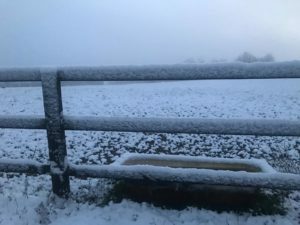 The longer nights, plummeting temperatures and wet conditions mean that caring for our horses is more challenging and takes a little extra effort. The winter months seem to drag on with no end in sight. 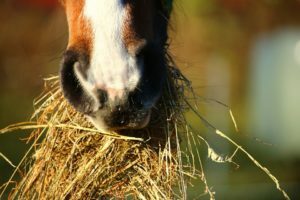 Ensure your horse has plenty of forage. Feeding plenty of forage actually helps to keep your horse warm. This is because the microbes and bacteria in the horse’s hind-gut produce heat when fermenting forage. Horses will often reduce their water intake as temperatures fall, sometimes by up to 40%. If possible keep the water source warm by topping up their water buckets with hot water twice daily. Fill a couple of large water containers in case your pipes freeze. Be sure to fill them every evening to ensure a constant back up supply. Placing a few apples in a water trough can help prevent it from freezing. It can also help provide some environmental enrichment for your horse. Rubber Buckets are easier to remove ice from than plastic buckets. Plastic buckets used for water can also crack when they freeze. If your horse has a fine or clipped coat consider moving them into a heavier weighted rug to keep them warm. Try not to over-rug your horse, not every horse will need a rug. Check out www.redmillsstore.ie for Our Top 5 rugs this winter!